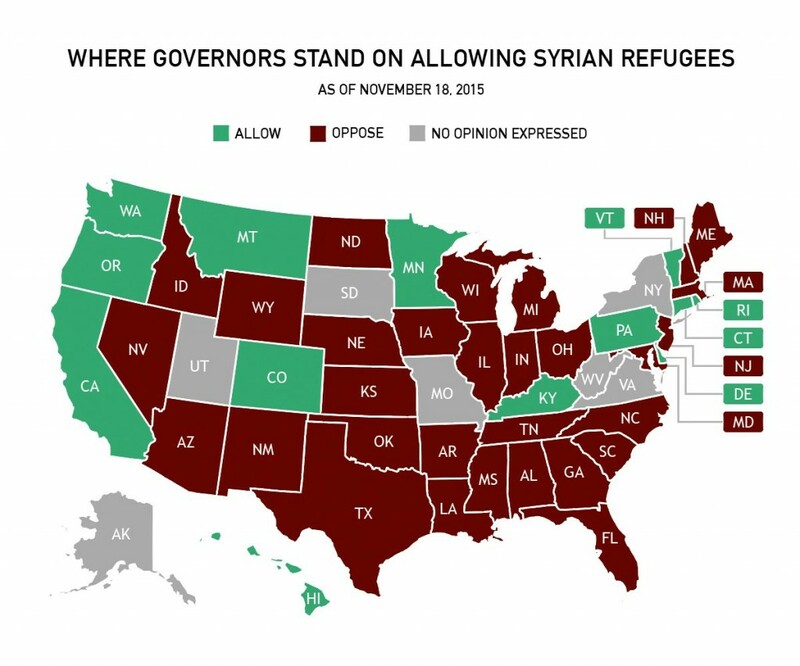 Which states are saying no to resettlement of Syrian refugees? As authorities made sense of the aftermath from Friday’s Paris attacks and the death toll count began to stabilize, reports emerged over the weekend that a gunman involved with the coordinated bombings and shootings may have entered Europe, embedded in the scores of refugees fleeing Syria. By Monday afternoon, the number of American state governors, many of them Republican, who released statements refusing to accept refugees ballooned to more than a dozen. The voices of opposition included presidential candidates Sen. Ted Cruz (R-Texas) and Jeb Bush, who told “CBS This Morning” that the U.S. screening process should only grant refugee status to Syrian Christians. Governors of Alabama, Arizona, Arkansas, Florida, Illinois, Indiana, Louisiana, Massachusetts, Michigan, North Carolina, New Hampshire, Ohio, Wisconsin, among others have all issued similar statements, promising to block Syrian refugees from entering their states. Problem is, states don’t really have a choice. According to Think Progress’ Ian Millhiser, the states are limited in their power to resist the intake of refugees, an action that’s specifically under the president’s purview. Instead, Scott said Congress ought “to take immediate and aggressive action to prevent President Obama and his administration from using any federal tax dollars to fund the relocation of up to 425 Syrian refugees” to Florida. Cecillia Wang of the American Civil Liberties Union said in a statement Monday that politicians were fabricating a link between the Paris attacks and Syrian refugee resettlement in the U.S. The U.S. plans to accept 10,000 Syrian refugees over the next fiscal year. Some Democrats, including presidential candidates Hillary Clinton and Martin O’Malley said that number should increase to 65,000 Syrian refugees. Either way, state governors will have to yield to Obama’s plan. 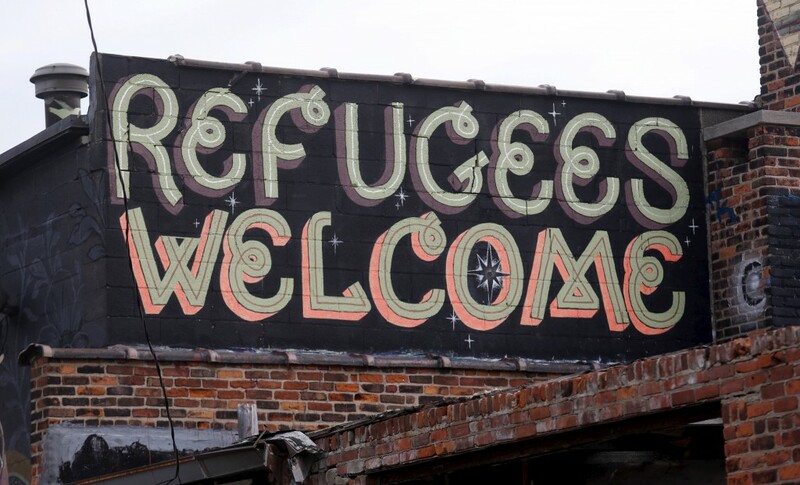 According to The New York Times, the U.S. has accepted 1,854 Syrian refugees as of Sept. 2015. Over the same time period, Germany has accepted nearly 93,000 refugees. Speaking from Antalya, Turkey, on Monday, President Obama said the U.S. and other countries should continue to accept refugees leaving Syria, adding that they were the ones that are more harmed by terrorism, especially the brutal tactics of the Islamic State militants. Washington Gov. Jay Inslee supported Obama’s stance on providing sanctuary to Syrian refugees. “Washington will continue to be a state that welcomes those seeking refuge from persecution, regardless of where they come from or the religion they practice,” he said.